I certainly have been looking forward to this for quite a while. This franchise has remained a personal favorite of mine over the years. It is such a relief to say that this didn’t remotely disappoint. While some movies or ovas have had their flaws, there isn’t much I can criticize about ‘Dear my sister.’ It was a wonderful return to the GochUsa world for an hour. This may not be a third season, but it was effectively a quarter of one and that’s good enough for me XD! It very much felt like a string of episodes that could fit into the timeline of this show nicely. Cocoa going away for a few days and getting to see the impact that has. Not a bad focus and even had the benefit of Cocoa getting to spend some time with her mother and Mocha. Much like the previous seasons this film did a nice job showing different relationships among the cast. The big focus came with Rize and Chino. 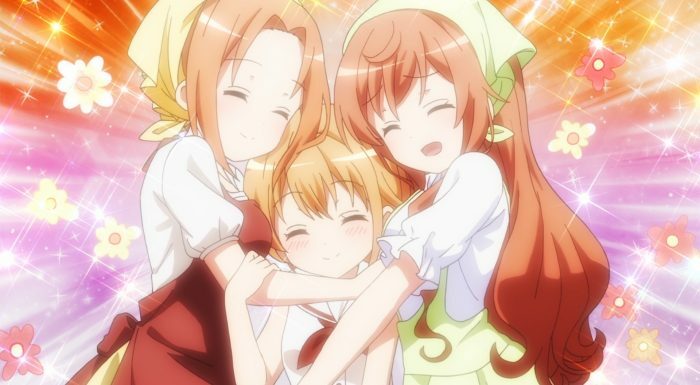 They were working together since before Cocoa first showed up and yet the series hadn’t delved too deeply into that connection. It was pretty amusing that Rize also pulled a gun on Chino when they first met. I’m sure glad she managed to get past that as time went on. It was fun to see how things played out over time before they found a comfortable relationship. Rize was a bit overpowering for Chino, but they figured things out. I like the reveal about Rize making that stuffed toy for Chino and that being part of the reason they built a friendship. 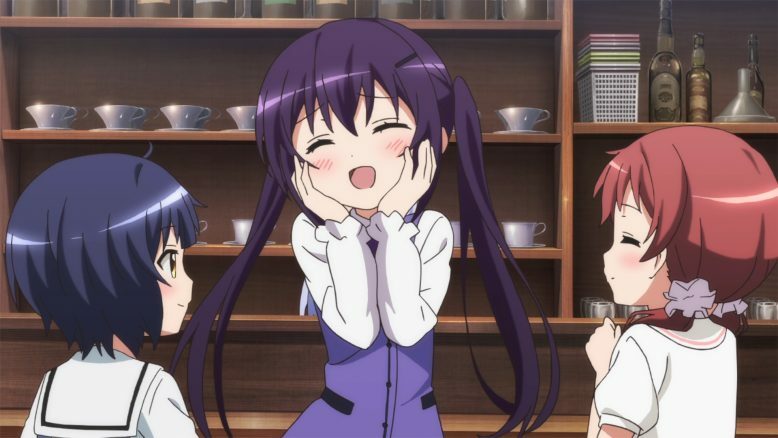 I just like how Rize behaved in this movie. 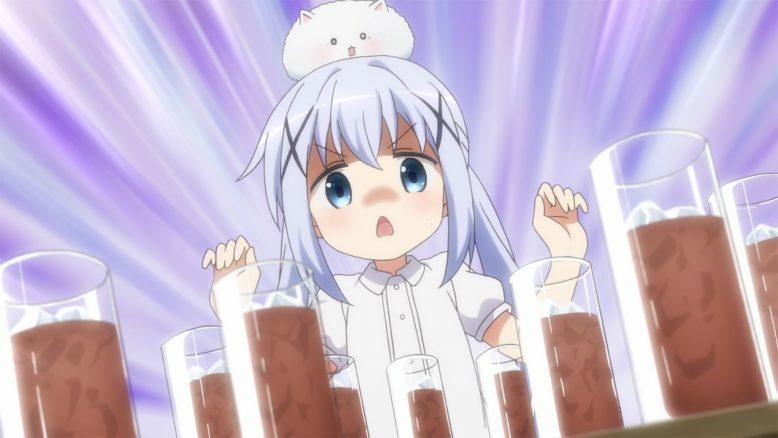 She wanted to do what she could for Chino, but knew she couldn’t just replace Cocoa’s energy or personality. The best she could do was try to make things so busy that she didn’t have time to be lonely. A pretty generous attempt since no doubt Rize was feeling a bit lonely herself. A great part of this thing was showing the impact Cocoa has on everyone around her. 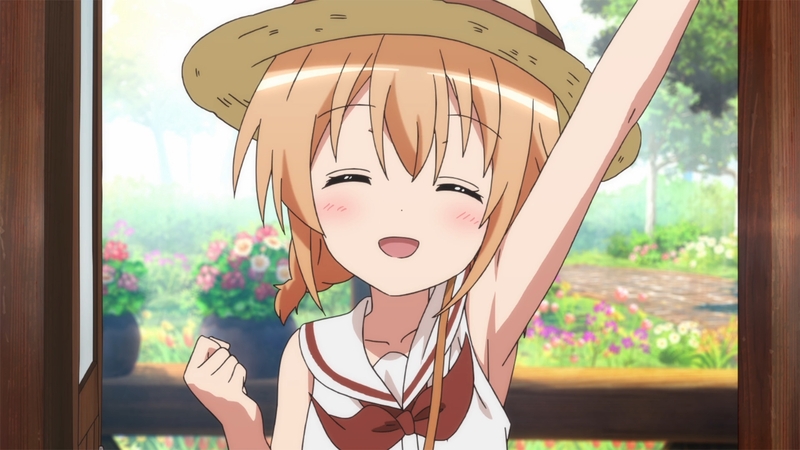 Of course the impact on Chino is obvious, but Cocoa’s energy and brightness has left a mark on all her friends. Even her just being gone for a few days leaves a clear gap in their lives. Of course I love having Cocoa around with everyone the most, but this is a nice thing to do now and then. And it was nice for Cocoa to go home for once. While she is living a full and happy life with the main cast, her family still misses having her around. Even though we only do get to see Mocha and her mother it was a nice little family reunion. Letters are nice and even phone calls can be comfortable. But there is nothing like having family right there with you in person. No doubt just getting a few hugs in with her daughter was incredibly valuable for Cocoa’s mother. It is her youngest child who has been gone for over a year. Enough focus was put on the home visit itself. We got to see a very nice town that Cocoa came from. That bakery is quite the booming business. No wonder that magazine back in season 2 featured their place quite prominently. They make some good food there and apparently even make deliveries. I think the speed (or lack of it) that comes with working at Rabbit House is more Cocoa’s speed. Although she was pretty ok working with Chiya for a time too. I suppose the difference is that the bakery was insanely packed and there wasn’t even really time to let Cocoa’s interpersonal skills shine. People were just grabbing the food they wanted and bringing it to the counter. Not much time to chat when you are packing up food to go. That farewell seen was pretty darn dramatic XD. Not surprised of course that Cocoa was really emotional. Leaving Chino and her friend behind even for a little while is hard on her. 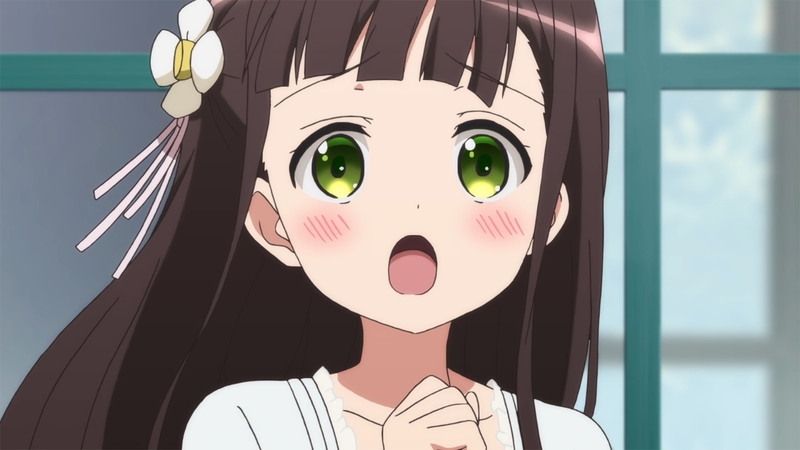 But Chiya of course was also really upset about Cocoa leaving. 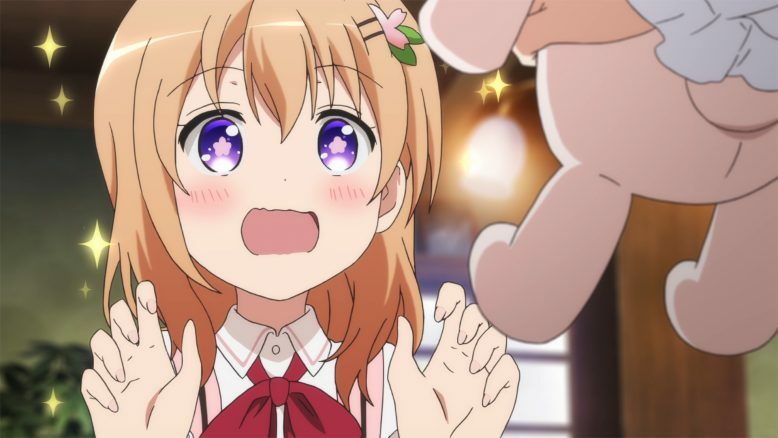 I like even Syaro joining in the cry session and showing how attached she’s gotten to Cocoa over the past year. Maybe at points in S1 she wouldn’t have been that upset, but after all the time that has passed having her go away isn’t that easy. But they managed to make that farewell pretty amusing as well with Cocoa passing the torch of big sister to Rize while she was gone. 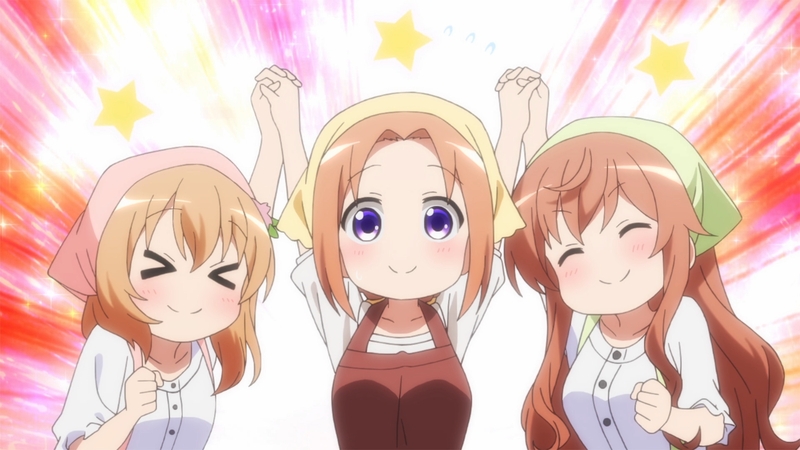 Another good moment of hilarity was Chiya buying so much pure cocoa due to missing Cocoa XD. Cocoa’s name is quite handy for this kind of humor. I do love having Cocoa with her friends, but seeing how they deal with her not being there made this worthwhile. 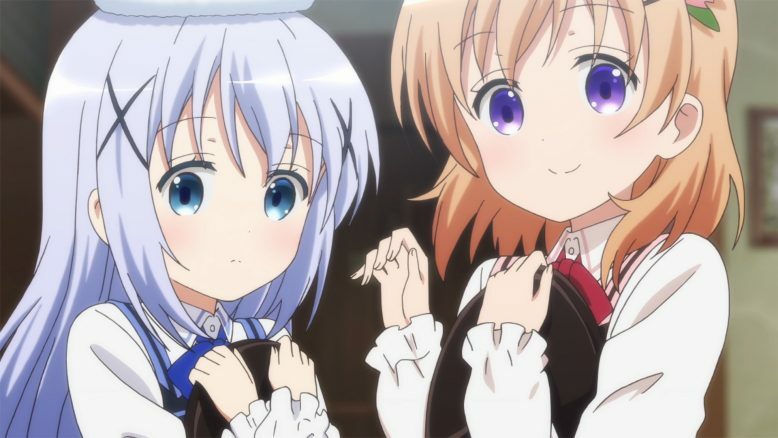 The big thing besides Rize and Chino, was of course Chino and Cocoa. This isn’t the first time Cocoa has gone away (she did that sleepover with Chiya back in S1). And so her version 2.0 of being Cocoa sick was pretty entertaining. But this did have the potential for Cocoa to be gone for significantly longer. And Megu/Maya weren’t staying over every night to help push away any loneliness. This time she did have to feel that gap that was created without Cocoa around. The Chino of the past was used to that quiet and didn’t feel as lonely. But after having someone so energetic that she does consider a sister being around…the lack of that person is harder to handle. There wasn’t as much focus on Cocoa being lonely and that makes sense. While everyone is dealing with the lack of her, she’s dealing with the additional presence of her mother and Mocha. If she wasn’t so happy to see her family then she might have been even lonelier than she was. And you could tell from that quick phone call how happy she was to talk to Chino again. Even if Chino was trying to act tough and that phone call didn’t last too long. I’ll also say that I like this appearance for Mocha more than the two episodes she was there for in S2. She was a force of nature in S2. Here she was a bit more calm and not overpowering everyone else. It was fun seeing her interact with Cocoa and her mother. The little scene of Cocoa giving Mocha the cold shoulder only lasted for a short time, but was extremely entertaining XD. They even touched back on the ‘three sisters’ pun from S2 with this time it being two real sisters…and their mother. I was able to just enjoy the dynamic of Cocoa and Mocha more in this. You can really tell how precious Cocoa is to her and how happy she is that Cocoa thinks the world of her. For all the benefits though I was happy to see Cocoa back with the group at the end. That really is where she belongs. That she calls Rabbit House her second home makes total sense. 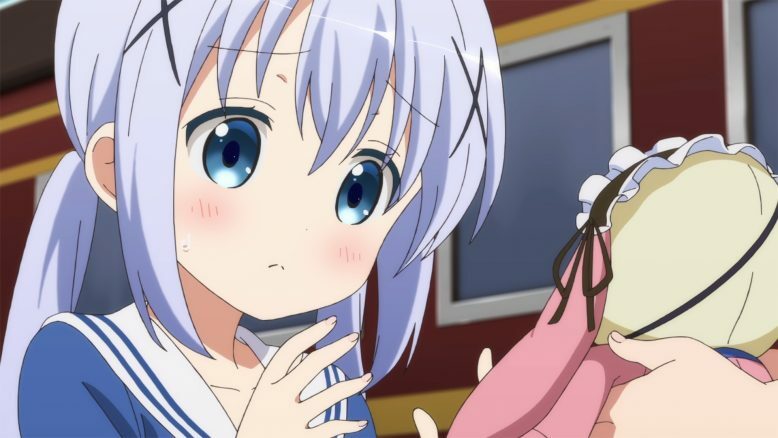 She may idealize being a big sister in general, but she really does want to be a good and proper older sister to Chino. It isn’t just a place she stays, but a place she truly does feel at home. Of course Chiya was the first to get the hug in with Cocoa, but Chino also got in an emotional ‘welcome home’ herself. Maybe my favorite part was after the credits with Cocoa and Chino having that little chat about the stuffed toys the group made. Cocoa going on a bit of a journey is nice from a story point of view, but I most enjoy having her interact with the cast. Honestly this was near perfect. It may not pull in anyone who isn’t already a fan, but those who love this series will get a kick out of it. It has everything this show does well. We got some good character moments, some laughs, some feel good emotional scenes, and continued character development. Much like the past couple seasons this just leaves me hungry for more from this franchise! It was a good hour of enjoyment and I couldn’t help watching it a second time after I finished the first viewing.